The first-of-its-kind span over the Maine Turnpike completes a 6.2-mile stretch. 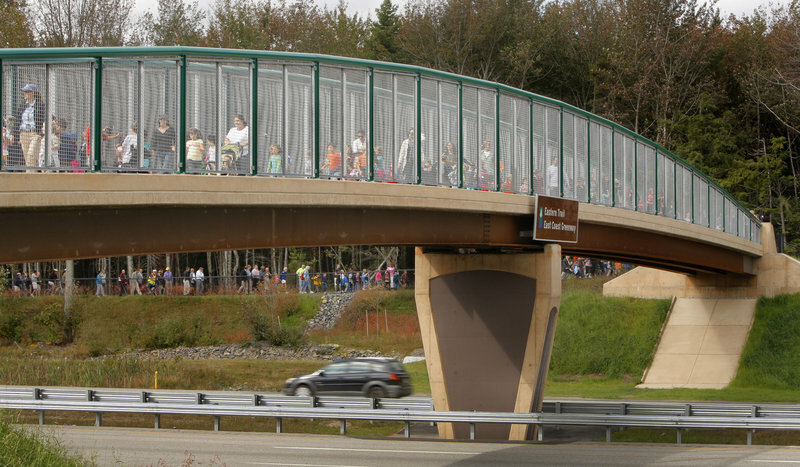 KENNEBUNK – As John Andrews watched nearly 500 elementary school students cross the Eastern Trail Bridge over the Maine Turnpike during its official opening on Wednesday, all he could do was smile. 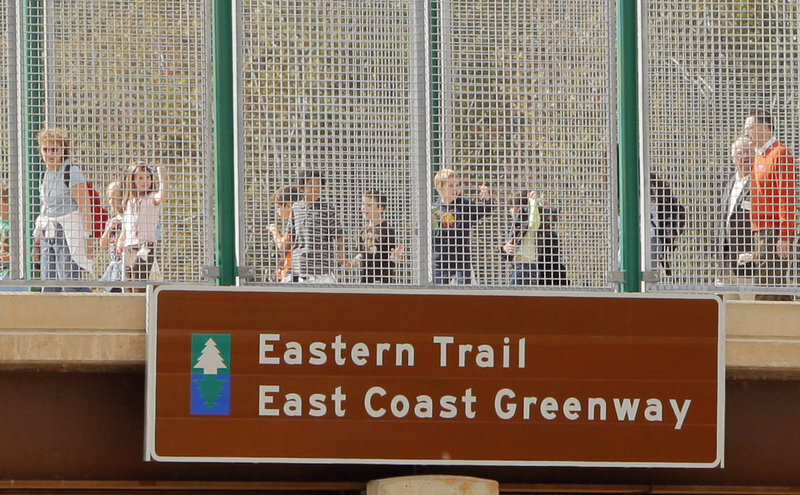 “I’m just awestruck,” said Andrews, founder of the Eastern Trail Alliance. 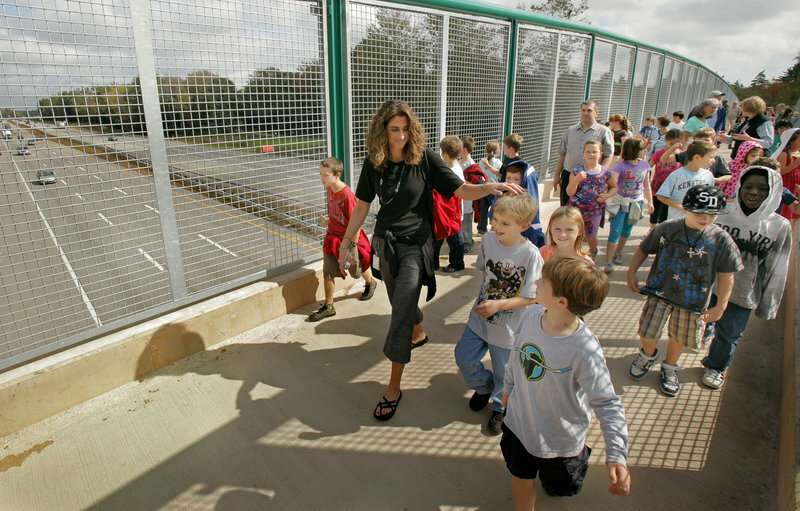 Third-grade teacher Heather Keep leads some of the nearly 500 elementary school pupils crossed the new Eastern Trail bridge over the Maine Turnpike in Kennebunk on Wednesday to help dedicate the structure. John Andrews, founder of the Eastern Trail Alliance, said getting the bridge built was the “biggest challenge” for trail supporters. The bridge, solely for the use of pedestrians and cyclists, is the first of its kind spanning the turnpike. The bridge, solely for pedestrians and cyclists, is the first of its kind spanning the turnpike. It completes a 6.2-mile section of trail from Kennebunk to Biddeford, and Andrews called it “the biggest challenge” in building the trail. “I’ll tell you, I stand on that bridge and I really get choked up,” now that it’s finally complete, he said. The $1.3 million bridge, funded by the Maine Turnpike Authority, is a key element in the alliance’s mission to complete a 65-mile stretch of off-road trail from Kittery to Casco Bay. A bridge over Route 1 in Saco, expected to be installed by Nov. 1, will help complete nearly 21 consecutive miles of the trail in that area. 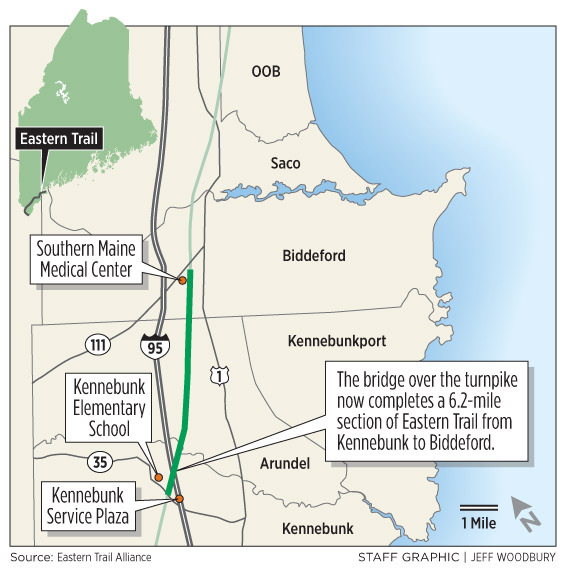 At the opening ceremony Wednesday at Kennebunk Elementary School, Maine Turnpike Authority Executive Director Peter Mills said the bridge is long overdue. He has heard for years about the need for a safe place for walkers and cyclists. Technically, the bridge opened about a month ago. Many people are already using it, from moms with strollers to geocachers, said Scott Tompkins, spokesman for the authority. After the ceremony, Miles the Turnpike Moose led the children over the bridge. 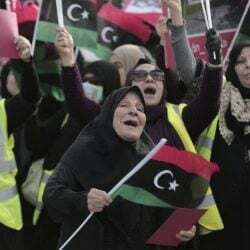 They waved at motorists driving north and south on Interstate 95 below; some drivers responded by honking their horns. “This is great!” one boy exclaimed.